Rolls on 6" heavy duty casters; 2 rolling and 2 swivel/locking casters to steer the display & lock rack into place. - 4-6" heavy duty casters; 2 rolling, 2 swivel & lock. 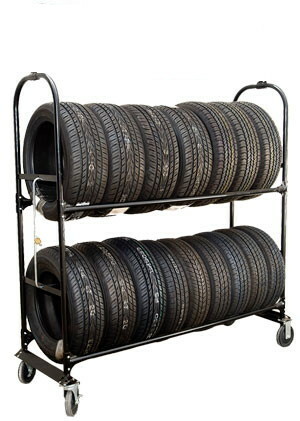 - INCLUDES locking bars & lock - This rolling rack can display 16-18 tires.